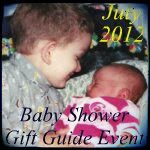 Being Frugal and Making It Work: Baby Shower Gift Guide & Giveaway Event - Begins Today! Baby Shower Gift Guide & Giveaway Event - Begins Today! The moment has finally arrived! Thanks so much for stopping by to help celebrate our Baby Shower Gift Guide and Giveaway Event! We have 31 days of awesome reviews and giveaways to help you with baby shower gift ideas, party favors, gifts for mom-to-be, guest posts and much more!! and companies that are simply amazing! There are over 60 prizes worth more than $3000 up for grabs! our month long Baby Shower celebration! You're not going to want to miss it! I also want to send a special thanks to my awesome sponsors for making this special delivery event possible! Looks like a really fun event. The prizes don't look so shabby either! I'll help get the word out. How fun, this looks like it will be great event! What a great event! I love the prizes that you have. Great giveaway and so many chances to win. Thanks.